The upcoming 2017 edition of the Moto X will by all accounts be Motorola’s premium mid-range offering – sitting in its portfolio right below the new Z2. This phone has been talked about a lot so far, but some of the details purported to be about it have in fact turned out to be describing other Motorola devices, such as the G5 Plus. 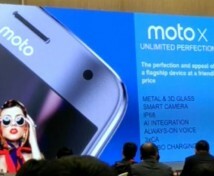 But it’s clear that we are getting ever closer to the Moto X (2017)’s launch, and today a presentation of the new handset has been leaked in China. As always, we can’t verify the authenticity of this, but here are the three most relevant captures from the nine-second video. 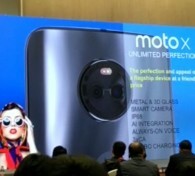 First off, we have to notice that the position of the dual-LED flash in this phone is different from what we’ve so far seen in leaks reportedly portraying the new Moto X. So either those past outings were once again showing other devices, or something’s off here. The spec list for the Moto X (2017), allegedly shared at that secret presentation, tells us that it will have a 5.5-inch display, the newly unveiled Qualcomm Snapdragon 660 SoC, 4GB of RAM, 64GB of storage, and a 3,800 mAh battery with QuickCharge support (the exact version of which is unknown). 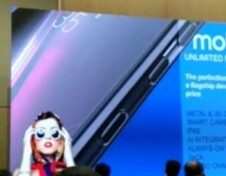 The handset will have a front fingerprint scanner, IP68 rating for water and dust resistance, a full metal build, and a laser autofocus for the main camera. There’s also something called “AI integration”, because Motorola simply couldn’t miss out on using the latest buzzword in the mobile space.